This green immune boosting shot recipe will put a pep in your step. When you're feeling a little run down, this healthy green drink will give you a shot of energy and help keep your immune system strong. 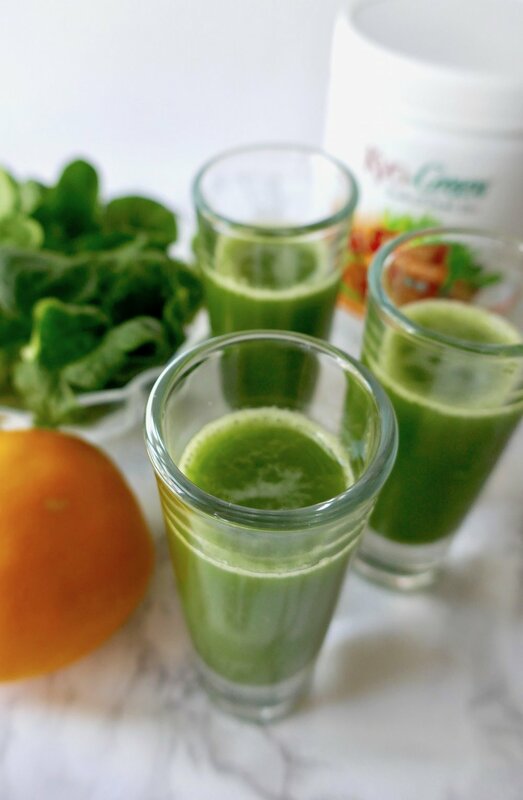 Thanks to Kyo-Greens for sponsoring this healthy drink recipe. Ever feel a little run down? I'm guessing everyone is nodding. It's hard not to feel depleted in this multi-tasking, crazy fast world we're living in now. One thing I like to do when I'm feeling stretched is to double down on some healthy greens. This recipe for a green immune boosting shot is one way I stay fueled. I don't always have as many greens as I want in my house, so I figured a way to do more with less. To be fair, Kyo-Greens actually has been helping me do more with less. Remember those tasty Cashew Lime Energy Bites? Those were filled with nutritious Kyo-Greens just like today's recipe. For this recipe, I'm working with the Kyo-Green Harvest Blend. Like the name suggests, it's a blend of ancient grains and plant-based nutrients including barley grass, quinoa, chia, and my nutritional crush chlorella. Yes, I have food crushes. Spirulina is right behind chlorella in terms of crushes, and yeah, that's in there. Can you say superfoods? Also included is a vegetable blend with the likes of broccoli, carrot, and kale, and then there's fruit too with all my favorite berries - blueberries, raspberry, and elderberry. Last, but not least, the Kyo-Green Harvest Blend includes very cool herbal extracts like green tea, grape seed, ginger, astragalus, and olive leaf. This whole medley plays a part in helping to support your immune system. A strong immune system will go a long way in keeping you healthy and illness-free. Of course, all of the other ingredients are gluten free, vegan, and GMO-free. This green immune boosting shot has just 3 ingredients, plus the Harvest Blend. The Harvest Blend gives you about another 25 superfoods with just one helping. How's that for easy? Even easier, you can snag the blend online here on Amazon. To make the juice, you just need a few big handfuls of spinach. 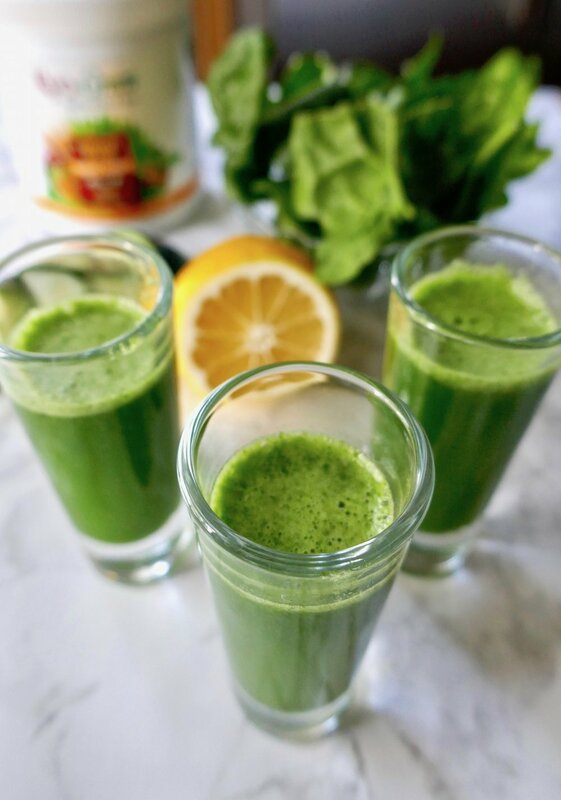 Because spinach isn't super juicy, you're going to get a condensed green shot. Don't worry though, you're still getting a huge helping of Vitamins A and K.
Cucumbers give you more juice, in addition to Vitamins A and C, and folic acid. They're super hydrating and can help with inflammation. And you have to love lemon for flavor, sweetness, and even more Vitamin C.
Put these power players together in one green immune boosting shot, and you get some huge health benefits. 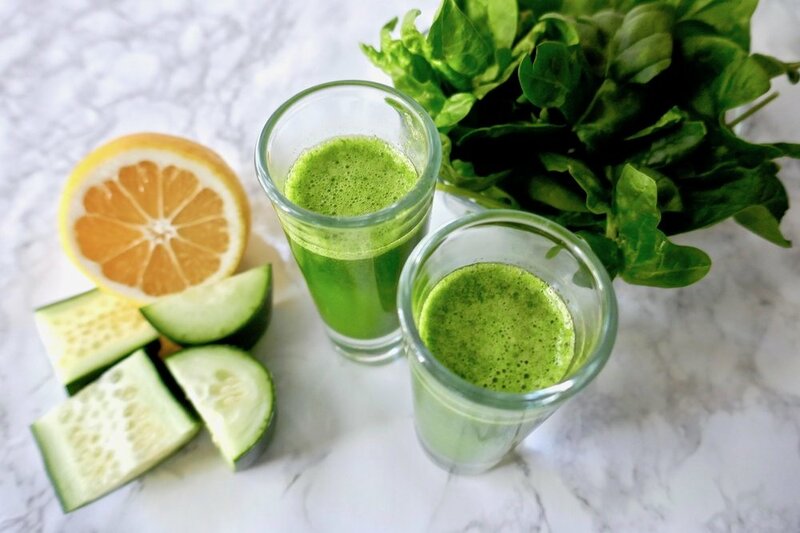 Place the spinach, cucumber, and lemon in a juicer. Mix the Harvest Blend into the juice. Pour into two glasses and enjoy. Want some Smoothie Recipe Inspiration?